The right alarm system is absolutely essential when it comes to protecting yourself, your staff, and your office itself from fires. The combination of an effective fire alarm and fire monitoring service can ensure that your team is notified of fire immediately, and that emergency services arrive as soon as possible. Fires can start and spread within seconds, so when it comes to alarm systems, every millisecond counts. Ionization: The air inside the smoke detector is ionized, which creates an electric current. Smoke disrupts this current and triggers the alarm. Photoelectric: Photoelectric alarms contain a small strobe light that is constantly on. Smoke particles cause the light to diffract, and trigger the alarm. Any of these devices should be regularly checked and maintained. 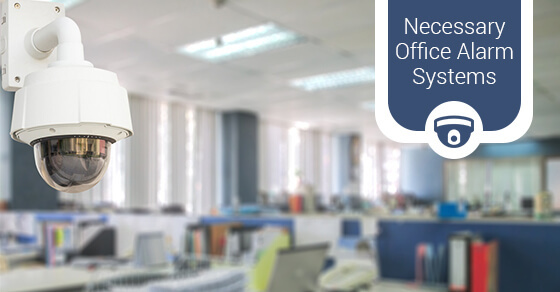 We definitely don’t think of office fires in our everyday lives, but making it part of your maintenance staff’s monthly routine to check devices and change batteries is necessary to keeping your company and its belongings safe. Once you’ve installed your devices, it’s time to choose a fire alarm monitoring service. At Fire Monitoring of Canada, we know that every second saves lives, and take advantage of any new technology to reduce response time. Our partnership with OPEN ACCESS™ ensures quicker fire department response time, by up to 2 full minutes. A fire alarm monitoring panel receives signals from the fire alarm or sprinkler system in your building. Once any of the detectors on these systems are triggered, an electronic signal is sent to the fire monitoring panel and the Signals Receiving Centre (SRC) is immediately notified. Once the SRC is notified, the operator will place an emergency call. With OPEN ACCESS™, however, the signal is sent to emergency services at the same time it is sent to the SRC, saving precious time. When choosing a fire alarm monitoring service, look for a reliable company with a good reputation. Ensure that the company can issue a certificate stating compliance with CAN/ULC-S561, and ensure anyone who touches your fire system has a certification with the Canadian Fire Alarm Association (CFAA). Remember that the most important thing when it comes to fighting an office fire is a quick response time…. fires cannot be mitigated without a call. By installing a good fire alarm system in your building, including fire monitoring that meets ULC-S561m and ensuring that a proper exit strategy is understood by all staff members, you can rest easy knowing you’ve taken the steps necessary to prevent fires, and should a fire occur, have emergency services notified as soon as possible. For more information, contact our team today.